Martin Luther's message of unity desipte color of your skin (or fur in our case) was not lost on us. We even shared a bed, without quarrel, in honor of this memorable day. Simba, you look like our Fracas over here in ArtsyCatsy. 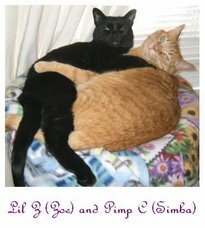 We hope you'll come visit us and, if we make you purr, want to link to each other?